My weight loss journey...: Losing "weight"
I've been having an internal struggle with something for quite a while about something pretty important to me. But before I say what that is, I'm going to talk about why I am. For several years now, I've been wanting to do the BAK. And now that I've lost all the weight (and so far kept it off), it's something that I know I can do and really want to do. Well, you can't do the BAK without a bicycle. I have a bicycle but not exactly one for riding the sometimes flat, often times hilly highways of Kansas. 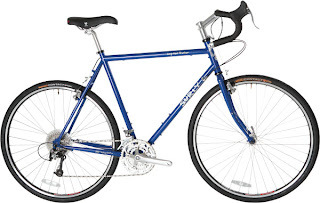 I like my bike but it's classified as a hybrid and is great for commuting and riding around town. The farthest I've ridden it is 27 miles. My dream bike is the Surly Long Haul Trucker. It's made for touring and riding long distances. The bike is not cheap so I have to save up for it and that includes selling a bunch of stuff. And that brings me to the struggle I've been having for a while. I've decided to sell my comic books. I love reading comics. I have since I was 9 years old when the 1989 Batman movie hit theaters and I've been collecting them off and on ever since. None of them have huge monetary value, just sentimental more than anything. I'm going to sell some next weekend at the city-wide garage sale. I'm going to try and get rid of a bunch of stuff and lose some "weight." Just because I'm going to sell my comics doesn't mean I'm giving them up. I still buy trade paperbacks or multiple issues bound in one volume to get my comic book fix. I'm sure I'll bring some along when I do the BAK to help pass the time in the evenings. It's going to be much harder mentally and emotionally to lose this "weight" than it was the 110 pounds I lost.